Amplify Color is one of the leading choices for accurate and high performing Industry Level Color Grading. Extremely easy to use and to integrate in your project, no coding required. An efficient color grading extension comparable to industry standards used in VFX and Film, future proof and high-performing even on mobile devices. Any artist can pick up this extension and quickly color grade a Unity scene. Be it via the semi-automated workflow where it actually connects to Photoshop or with other software such as Nuke, DaVinci Resolve or After Effects using the file mode. What does Rust, p.a.m.e.l.a., Manifold Garden, Firewatch, The Forest, Night In The Woods, Broforce, The Divine Unity Shrine, Soul Axiom and Star Wars Journeys Ep 1 to name a few have in common? Visit our Customer Showcase andProduct Page to find out. By using LUT's (Lookup Up Tables), any color profile created can be adjusted and even loaded at run-time allowing users to seamlessly blend between various looks. Users can also use Color Volumes, Dynamic and Depth masking to extend their color based effects. LUT's combine and retain all external color alterations; among other effects, Color Balance, Curves, Exposure, Contrast, Saturation and Hue adjustments will all apply to your in-game assets. Users can also take advantage of commercially available LUT packs and apply them directly to Unity Exported Reference Images using the File Mode or Photoshop connection. There are many types of LUT file formats but Amplify Color will only be able to read compatible Look up Tables in bitmap format(1024x32), as do similar effects in Unity; below is an example of a LUT image. What can a LUT do for RAW media? Check out the video below by the great team at Vision Color to find out and be sure to try out their LUT Packs. Amplify Color Volumes empowers your artists by allowing them to use volumes to efficiently define color correction, effects & events by area. Volumes automatically blend between LUT's, support Base and Volume LUT mixing and Third-party Effects Volume Blending whilst maintaining volume detection accuracy. Tonemmaping allows for quick and lightweight adjustments without the need to rely on additional camera components or 3rd-party effects, it also provides a HDR Dithering solution allowing for even more accurate results. Depth Masking allows you to blend different LUT’s based on depth information by simply adjusting a curve as you would with similar Unity components. Create interesting and dynamic scene moods or simply isolate certain assets based on their depth value such as skyboxes or backgrounds models. Masking assets is extremely quick to setup and it also works great with 2D Games, be sure to check the Project Samples in the Manual Page; section 6 – Dynamic & Depth Masks. Be sure to contact us if you run into any problems or if you have any questions regarding our products, we would be happy to help. You are all premium users to us, stay in touch, we would love to hear more about your work. 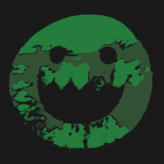 Amplify Shader Editor - Unity Node-based editor w/custom nodes and shaders, Full Source! Looks sweet, but the obvious question is, does it work with unity free? 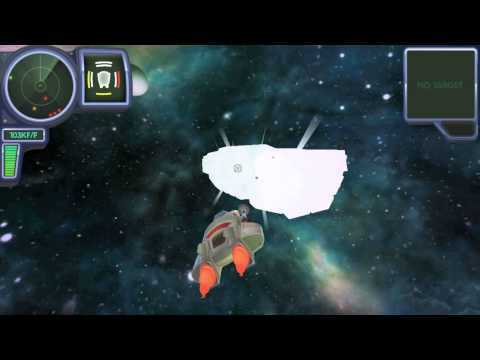 Sorry, no Free Unity Support...Unfortunately this is due to Unity imposed limitations on the Free version. Amplify Color is available on the Unity Asset Store and our Website. We recently expanded our licensing offer. All Amplify Products support up to 3 seats per license. Looking forward to all your awesome work! Update - A new demo is available. 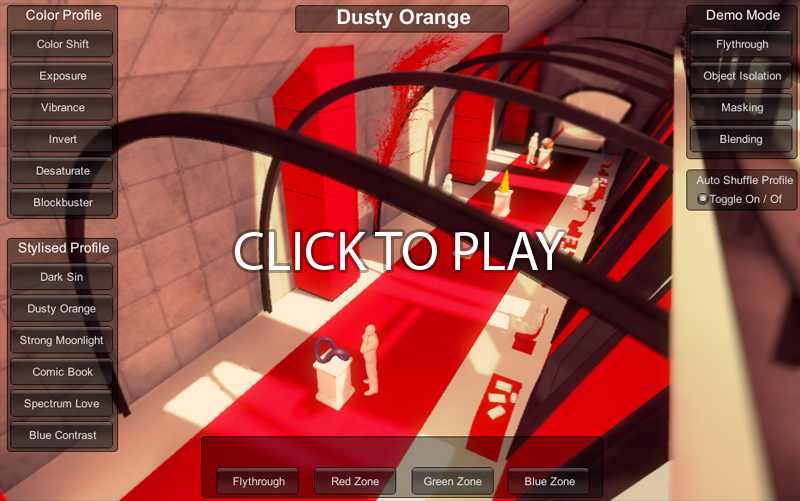 In this new stylized web demo you will be able to test most of the features provided by Amplify color. Color profile blending, object isolation and much more. any idea how well this would run on mobile phones these days or ipads? eg iphone 5s or ipad4? Short answer, it runs great on mobile devices! We recently released a mobile performance update. Test it out for yourself, we offer fully functional watermarked versions of all our products. Looks awesome. I think I will get this. 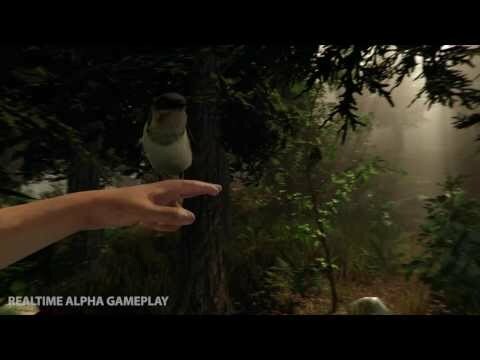 The Forest is an open world survival horror game currently in development for PC that just keeps getting better. Amazing graphics, gameplay and overall ambience, certainly set to to become one of the best Unity games ever made. A must have for any survival horror fan, follow it on Steam. Blog post and Screenshot Gallery. On an unrelated note, that youtube argument involving PC fanboys and console fanboys was hilarious. Never laughed so hard. On a related note, I'm glad to see this plugin getting more attention. I've been a proud Color3 user for a while now and it has been working great for me. I definitely recommend it! Happy to hear we still have some Color3 users out there (btw Upgrade to Amplify Color for free on the Asset Store). We don't know many of our unity asset store customers but we would love to feature your work if you are interested. We are happy to announce a new version of Amplify Color, currently 50% off in the Unity Asset Store. In this new version we introduced additional mobile specific optimizations and Color Volumes. Color Volumes: This new feature will empower your artists by allowing them to use volumes to efficiently define color correction by area. Mobile Mode: We introduced some new mobile optimizations that will give you an extra boost in performance when using older devices. Our friends at Rust LTD are getting close to deliver Alloy 2.0. 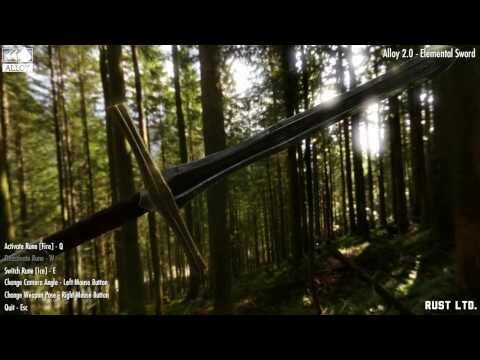 We would like to invite you all to try their Physical Shader Framework and their latest techdemo, Elemental Sword. The following techdemo demonstrates some of the improvements and extensively uses TC Particles, Skyshop and Amplify Color. Purchased. Awesome upgrade!! Another awesome Unity addition!! Awesome, you wont be disapointed. We have some cool updates coming soon to Amplify Color Volumes, stay tuned @amplifycreates. Ace Ferrara And The Dino Menace is a space combat simulation game featuring mystery, romance, cat-augmentation, space-faring dinosaurs and a heartfelt appreciation for 80s sci-fi cartoons. Developed by Philipp Seifried, the game will launch on iOS in early 2014, with releases on other platforms (Android, PC, Mac) planned later in the year. An awesome looking game, amplified by our color grading technology and developed entirely by one person, Philip did all the code, graphics, music/sfx, writing, cat-petting and PR. We also suspect he taught dinosaurs how to pilot spaceships and for one we welcome our new reptilian overlords. Amplify Color is not just for 3d games, flexible and robust it covers all your 2d game requirements. Check out this awesome project by Free Lives, an independent game design studio based in Cape Town, South Africa. 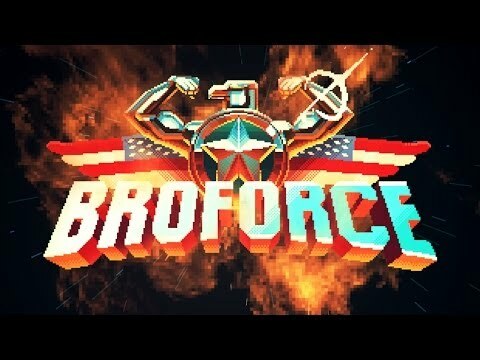 You play as 80's and 90's action heroes waging war against terror in almost entirely destructible nostalgic settings. Incredibly fun to play , amazing visuals, sound and VFX. We are happy to announce a new version of Amplify Color. In this new update we expanded our volume based functionalities and we now support volume based 3rd party effects and custom events. We also improved overall performance, added the ability to blend Base Luts with Volume Luts and added specific optimizations for overlapping volumes. Amplify Color is now open to everyone, the standard version includes all the required source files in order to develop new functionalities or to expand existing ones. Stay tuned we included a special preview near the end of this video. **We also updated our customer showcase, check it out! 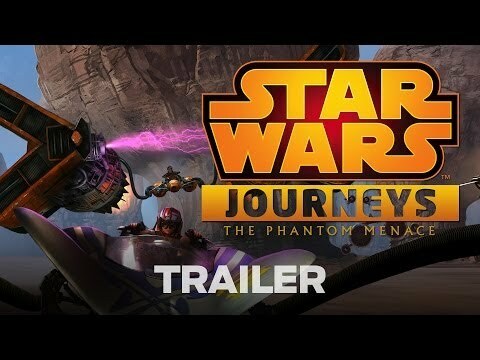 this looks really great! Its a shame I mised out on that until now. Great tool! Thanks! We hope it fulfills your needs. 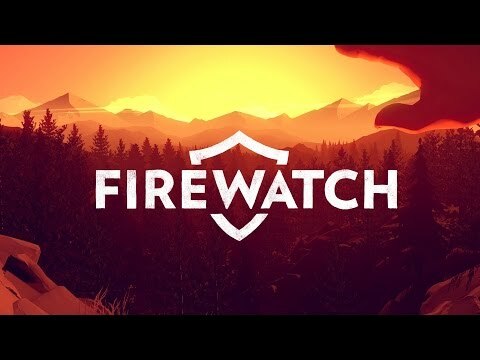 Firewatch, a absolutely gorgeous game and one of the great surprises from PAX Prime 2014. Among other techniques, the game makes use of Amplify Color for its incredible and dynamic environment mood, we definitely recommend that you check it out. Powered by Amplify Color, Null Operator is a 6-degrees-of-freedom procedural action stealth roguelike for PC and VR currently being developed by RUST. Inspired by old school games like Descente or Forsaken, as fans, we cant wait to try it ourselves.The game also takes full advantage of Alloy, one of the best physically based shading frameworks for Unity, and fully compatible with Amplify Texture 2. 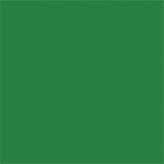 Amplify Color also works great with 2d games. Check out the fantastic work by Bombsfall and be sure to try out our fully functional Trial Version. Quick reminder, Amplify Color & Motion are currently 50% OFF exclusively at the Unity Asset Store. A bit of a shameless bump but for anyone interested, we would like to remind you that we currently offer 50% OFF on Amplify Color and Motion, exclusively on the Unity Asset Store. We would like to thank everyone that took advantage of our promotional offer and if you have not already check out our fully functional Trial Versions. The Unity related issue only affects trial version; the full version doesn't need extra installs. A great example of the quality that can be achieved with Enlighten in this new Unity 5 Tech Demo by Alex Lovett. We look forward to future demos, its always great to see our products in action, both Amplify Color and Motion were used to enhance the final look. Today was a great day for Unity users all over the world. With the announcement of the new and unrestricted free version of Unity 5 the possibilities are virtually unlimited. A very warm welcome to all free users, we look forward to your creations! Great to see some amplified projects up there, looking at you Divine Unity Shrine, Rust & Firewatch! Let us know if we missed any, we would love to help promote your project. We would like to invite you to try our fully functional Trial Versions and see for yourself what it can do for your project. 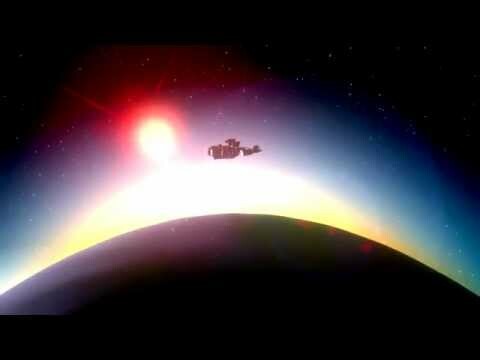 Developed by Allen Trivette & Lee Williams and published by Night Dive Studios, Spirits of Xanadu is an atmospheric exploration game set aboard a deserted starship in an alternate 1980s. 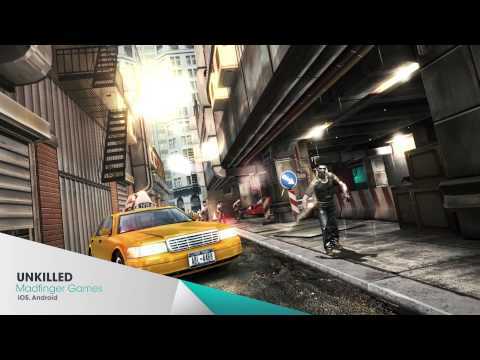 SX is amplified by our color grading and high quality vector based motion blur solution. You have to play it for yourself in order to fully appreciate it, if your are fan of the genre you wont be disappointed. Take it to eleven with 50% OFF Amplify Color! Great article about color grading and look development in Unity. Check it out if you want to learn more about the awesome product offering in the Unity Asset Store. Quick reminder, our own color grading solution is currently available at half-price for Level 11 Members. This is the Color Grading plugin you're looking for! Amplify Color, only $12.50 for Level 11 Members. Looking for affordable and high quality LUT's? Be sure to check the awesome Color Grading LUT Pack by Flow Fire Games, over 100+ color presets. 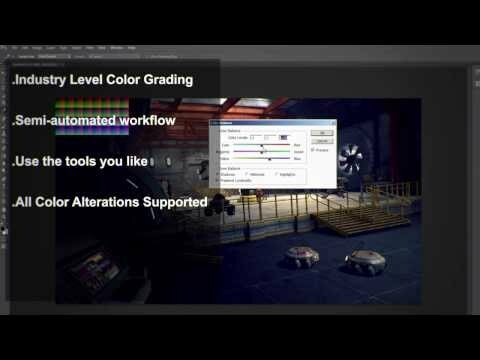 Our grading solution brings industry-level color grading to your Unity game by mimicking the color transforms made inside a tool like Photoshop or typical grading software such as Nuke, After Effects, Fusion or similar; e.g. change contrast, color curves, exposure, saturation, hue and more, or a combination of all transforms at once. For Desktop, WebGL, Mobile & Consoles. 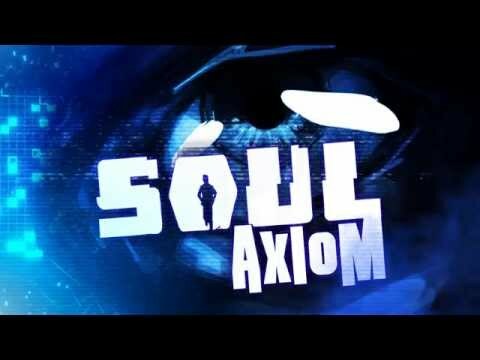 Soul Axiom is a fantastic indie game developed by Wales Interactive and amplified by our color grading plugin. 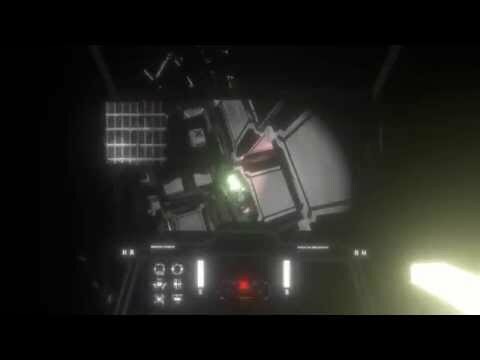 Great narrative and visuals, currently available on Steam for PC, Linux & Mac. A new major Amplify Color update is now available, directly trough the Asset Store or our own website. We would like to start by thanking you all for your patience when it comes to our occasionally slower iteration rate, we might seem silent but we are hard at work in the background with developers such as yourself; always exploring new features and improvement or providing the kind of premium support that you can always expect from us. Among other improvements in version 1.5.1 we introduce a lightweight Filmic Tonemapping option, appropriate HDR Dithering & adjustable Exposure. It's now possible to use Depth-based Masks via a curve controller and we also added 2D Collider support. By working closely with a few select developers we also found a critical workaround for a HW Clamping related issue plaguing the iPhone5s/iPAdAir, we also improved color space conversion, shader optimization and error handling in Unity 5. Be sure to visit our blog for the full change list, try it today! Stay tuned, we are working on innovative tools that will greatly improve your workflow and ease of use. 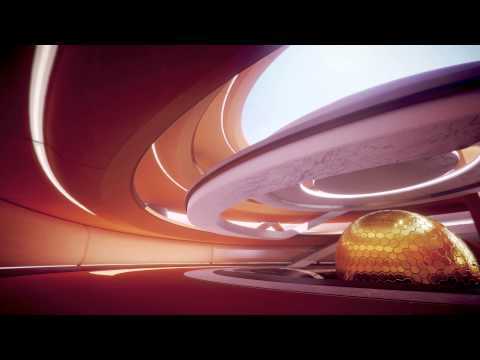 The award winning NVYVE Studios raised the bar on what can be achieved with Unity 5. 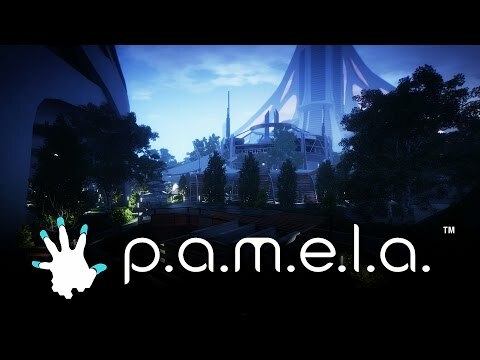 If nextgen indie AAA had a name it would be p.a.m.e.l.a.. Amplified both by our Color Grading and Motion Blur solution it delivers fantastic visuals and a gorgeous aesthetic inspired by games such as Mass Effect, Deus Ex and Bioshock in a fully dynamic open world game with RPG elements. It's hard to believe that p.a.m.e.l.a. is being developed by a team of 6, we are very happy to see our products in action on this type of project; it's a great example of how much they simplify and improve overall workflow and visual capacity. Color Grading and Quality Vector Based Motion blur without any hassles, reliable and high-performing across multiple platforms. 1st place on Greenlight in 48 hours, be sure to follow it on Steam for instant updates. 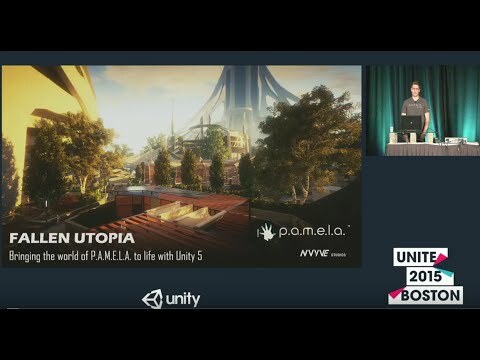 Be sure to check out the NVYVE Unite 2015 session: Fallen Utopia  Bringing the World of PAMELA to Life with Unity 5. 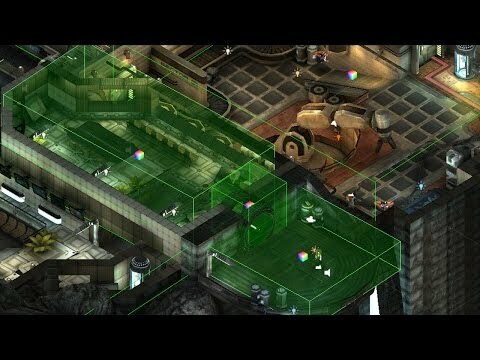 In this session Adam Simonar goes over the concept and design process behind the games unique aesthetics. Updated the first post for quick reference and easy access to the latest information. Amplify Color provides advanced color grading in a all-in-one easy to use package and can be yours for only $13.75 in the next 24 hours. Try it today! What does Firewatch, p.a.m.e.l.a., Manifold Garden, Rust, The Forest, Night In The Woods, Broforce and Star Wars Journeys Ep 1 – to name a few – have in common? Check out our full suite of Amplify Unity Products and find out what they can do for your project. We are happy to announce a new Amplify Color update, now with 10 FREE Premium LUT textures included in the package. 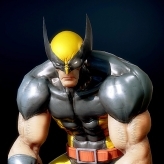 Among other improvements, the new update includes improved tone mapping capabilities with white point control, ACES support, and we also removed all keywords. Looking for professionally crafted color grading presets? 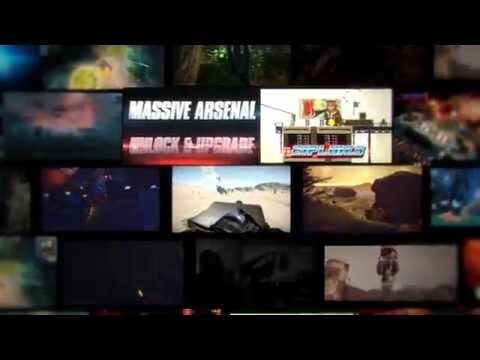 Check out the Amplify LUT Pack, over 200 LUTs in a comprehensive and varied collection. 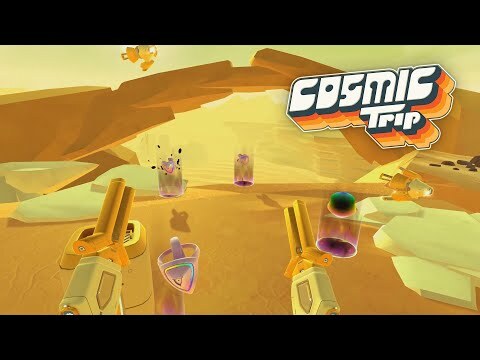 Cosmic Trip is a VR-native first-person real-time strategy game. It makes great use of Amplify Color, the results are cohesive and aesthetically pleasing. You can learn more about the Funktronic Labs development process in their recent Made with Unity article, be sure to check it out. From the legendary creator Keiji Inafune and Armature Studio, the team behind the “Metroid Prime” series, comes ReCore. You play as Joule Adams, a young survivor of a terrible cataclysm who journeys from Earth to the desert world, “Far Eden” to build mankind’s new home. 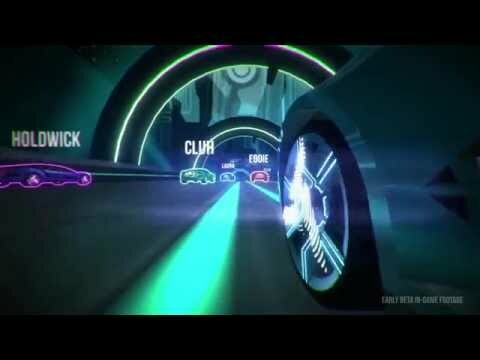 Making great use of Amplify Color, it’s another awesome example of what can be built with Unity. You can learn more about the development process in their recent Unity Blog post, be sure to check it out. Virginia is a single-player first-person thriller set in a small town with a secret. Experience a missing person investigation through the eyes of graduate FBI agent Anne Tarver. Making full use of Amplify Motion, Amplify Color and the Amplify LUT Pack, Virginia delivers a unique and immersive experience. 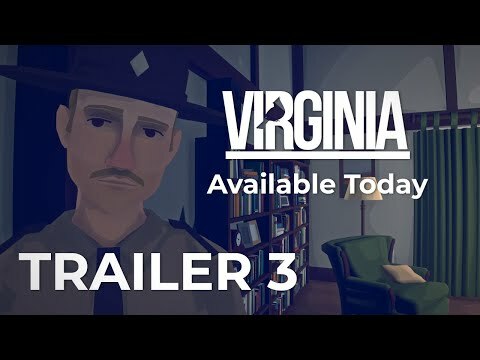 Virginia, by Variable State - Get it on Steam! Don't miss out, only $13 during the Birthday Bonanza Madness Sale! Night in the Woods is finally out! Be sure to check it out on Steam. It's a great example of how Amplify Color can help you tweak 2D game visuals. We invite you all to check out the fully functional trial, see for yourself what it can do for your project. Get Amplify Bloom for only $17.50. We love seeing 2D projects taking advantage of Amplify Color. Be sure to check out Party Hard and their frantic stealth action gameplay. Quick heads up for anyone interested in adding Amplify Shader Editor or any of our other products to their collection, the Unity Asset Store MADNESS SALE ends today! Now is the best time to get our packages at half price!